INVISIBLE LONDON AND HOW IT DISSAPEARED. Returning to London after spending half your life in Australia you notice many changes, it's a normal sort of thing that happens with every major city and its called re-development. . The old gets replaced with the new and the city of London takes on a new clean appearance. . I happened to visit St. Pauls a few years ago in hope of finding a stone that had been recovered in the grounds of St. Pauls during renovations or an Archaeological dig. Whatever, the reason this mysterious stone had disappeared and no one knew much about it. . I was doing some research myself at the time and taking my cam-corders around with me to record scenes that might be included into a documentary feature I was working on. .
St. Pauls is at the top end of Fleet Street and it used to be my old stomping ground years ago. Fleet Street used to be known as the Inky Way years ago because it was the home of virtually all the Newspapers where I was trained in my profession as a photo-journalist. . Between St. Pauls and the Daily Express building was Ludgate Circus and it was a hive of activity there with many pubs offering cheap meals at lunch times. 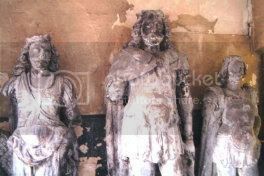 But Ludgate was well known because the Place got its name from one of Britain's most famous Kings who was known as King Llud. .
One of the things I had put down as a matter of interest was the great statue of King Llud and his two sons that had been a feature at this spot for centuries. As a child I was taught that this King Llud had built London and he had two son's who were positioned, one either side of him. The problem was this statue that was dedicated to the man who virtually founded and built London had simply disappeared into thin air. .
From memory Llud had built a huge gate that was part of the defences of the City of London and this Gate had been named after him hence the name Ludgate. It was said that when he died Llud was buried near his great gate. . Without the Llud memorial statue I was wondering how I was going to tell the story of Llud and was finally told about drawings of the statue was in Guildhall so off to guildhall I go in hope of getting to see the pictures. . There I was told that the statue had been moved to Regents Park so off I go on a merry go round that went nowhere and several hours and sore feet later still came up with no results. . Asking anyone in London what had happened to the statue was fruitless because most Londoners today wouldn't have a clue who he was or why he was famous. .
Well for starters he lived at a time when Julius Caesar had just defeated Gaul into submission and thought he would expand the Roman Empire by including Britain too. .
Llud had a brother the Roman's called Cassivelaunius who was none other than Caradoc I. .
Caesar made two attempts to defeat the British and on both occasions he was given a good hiding every time he tried. Caesar had not counted on the tides and inclement weather which destroyed half of his fleet or the cunning way the British decided to fight their battles. .
Caesar had not counted on the British use of Chariots which they might have been familiar with in area's but did not expect the British to use them on the battle field with good effect. .
One of Lluds sons sought out Caesar on the battle field found him and took Caesar on in a fight to the death. During the fight Caesar thrust his sword into Nennius's shield and because it was made of several layers of leather try as he may Caesar could not recover his weapon. . In those days if the leader lost his sword the battle was over and they lost the fight. However it didn't end there because Nennius received a fatal blow in which he would die three days later from blood poisoning because they used to use arsenic when making the sword. .
With the sword in British hands it was paraded all around London and the country. 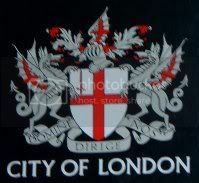 In fact they even included it on the City of London Coat of Arms and it has been on it for centuries in the top left quadrant where it can still be seen. .
Caesar made two attempts to defeat Britain and he failed on both occasions. . 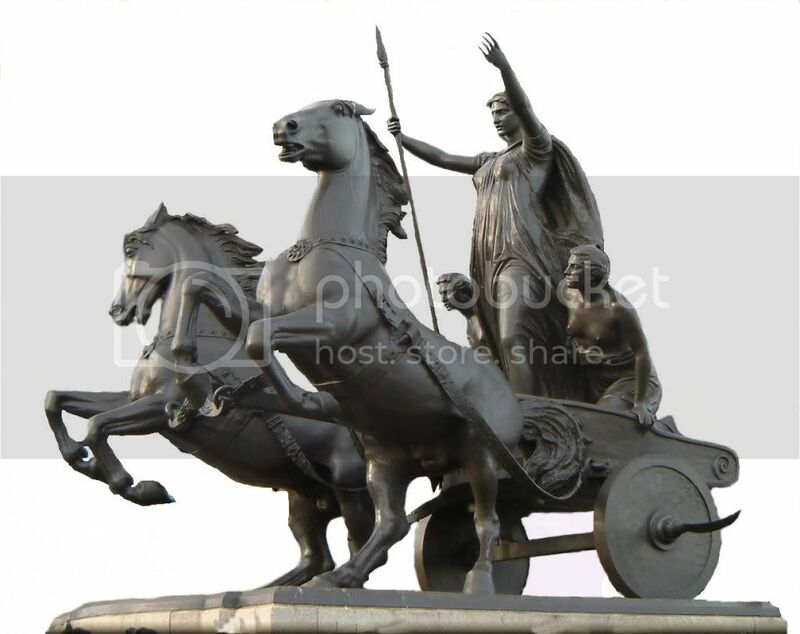 Here's the interesting part, numerous battles took place from Deal to the South side of the River Thames opposite the Houses of Parliament. .
Now if you visit the Houses of Parliament at Westminster you will find a huge memorial to Boadicea the Icini Queen who had another row with the Romans. .
That's another story though; now imagine 4,000 of those chariots all lined up in formation on the North side of the River Thames which can only be crossed at low tide and with great difficulty because of the fast flowing water of 10 knots or more. .
How many Romans died when the archers filled the skies with their arrows as the Romans attempted to cross the fast flowing water? . 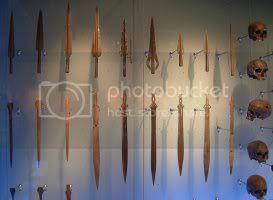 Ok you have the picture, now go to the Museum of London and in the first gallery you come to you will find a huge cabinet full of all sorts of Weapons that would normally be associated with a huge battle. . However you forget this is England and no such battles ever took place so you have the inventions of Votive offerings that the London Establishment of highly trained professional historians and Archaeologist state they are. .
Can anyone take anything any academic, be they Historian or Archaeologist seriously when they do stupid and ridiculous remarks such as this and fail to identify the truth and give it to us? Even a 10 or 11 year old child would have a better comprehension of real history than educated clowns which is what they are. . It makes one wonder what these so called academics are taught if they don't know anything about British History or where they were Educated even. Maybe they send them to Ireland who knows because they know stuff all about Llud. . Finally if you have you nose to the grindstone long enough and you do your research you finally get a lead and I finally tracked the missing statue of Llud and his two sons down to a Church next to the Law Courts in the Strand which is the top end of Fleet Street. .
Tucked away out of view and concealed in a part of the church that no one even thinks of looking is the elusive statue of Britain's Hero who kicked Caesar and his legions back to Rome. . In Trafalgar Square there is an empty plinth that today is used for all sorts of stupid events that morons like to call arts. 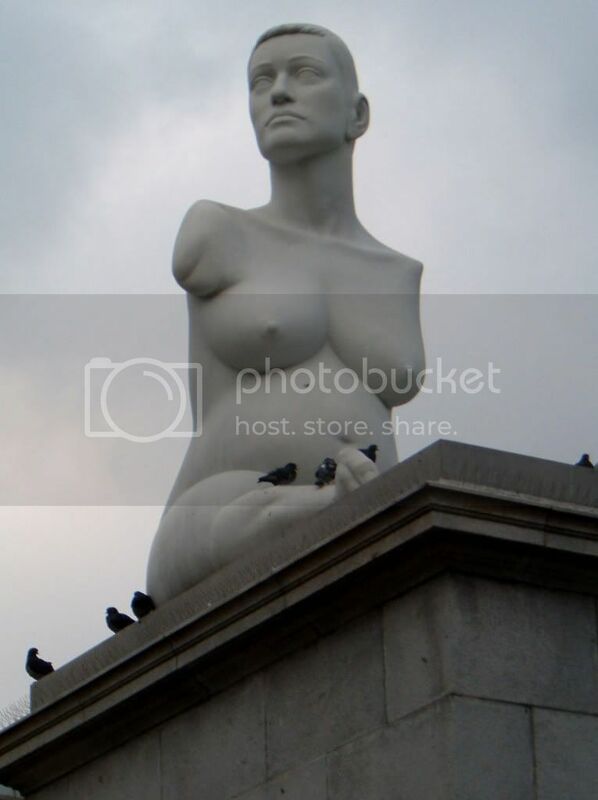 One year it was for a statue of a very pregnant woman which in my opinion was disgusting and offensive. But that's what they call art these days. .
What more fitting place could there be at a time when Britain is trying to promote brutishness than to clean and restore Lluds statue and put it on the plinth because of all people he deserves it because he fought off the Romans and founded London as a Founder he is entitled to that position instead of a load of jokers. .